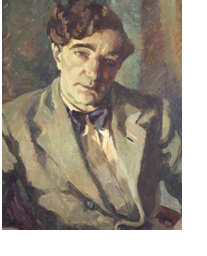 James Hanley had experience in the Merchant Navy, which led him to write Boy (1932) (a book which was famously banned after a trial in 1934 and not republished until 1990), as well as other novels set at sea. In 1946 What Farrar Saw was published, which was set in a near future post-war Britain, in which a nation-wide traffic jam can be seen as a metaphor for a sclerotic class-ridden society. The immediate solution in the novel was to clear the traffic jam with bombs, rather than to reform the system: see Clute in the Encyclopedia. According to the Oxford Dictionary of National Biography and the Dictionary of Irish Biography, he was born in Dublin in 1901, although the DIB does add “reputedly”. According to their stories, his family was moved to Lancashire by his father, who worked as a stoker the Merchant Navy, in 1908, and lived in Kirkdale, near Bootle. The ODNB says that James ran away to sea at the age of 12; the DIB says he was 13. The Wikipedia article on Hanley, basing itself on Chris Gostick’s “Extra Material on James Hanley’s Boy“, published in in the OneWorld Classics edition of Boy (2007, pp. 181-4), says that Hanley was born in 1897, not 1901, and in Kirkdale, and not Dublin. Both his parents were indeed born in Ireland (his father in Dublin and his mother in Cobh); his father was generally employed by Cunard, operating out of Liverpool. Hanley left school in 1910, and worked in an accountancy office in Liverpool for several years, before going to sea in 1915, at the age of seventeen. See his War Experiences for what happened next. The first novel that he published was Drift (1930). According to the DIB he married Dorothy Enid Heathcote (who wrote herself as Timothy) in 1931; according to the ODNB, their marriage was in 1947. Both sources agree they had a son in 1933. Boy (1932) was about a ship’s boy who was sexually assaulted by other members of the crew, caught syphilis from a prostitute in Alexandria, and was killed by his captain as he writhed in agony. (The DIB says “put down”, which is an odd way of describing a mercy-killing.) The novel was published in 1932 in a limited edition, to little comment; it was only when it was published in a larger print-run, with a lurid cover, that it was prosecuted for obscenity. Hanley lost the trial and the books were destroyed. In 1935 Hanley was with E.M. Forster at the International Congress of Writers in Paris, when Forster delivered a speech on “Liberty in England” which talked about this trial in relation to censorship as a whole; the speech is published in Forster’s collection Abinger Harvest (1936). (Forster had become the first President of the National Council for Civil Liberties in 1934.) Boy was republished after Hanley’s death, in 1990, by his son Liam, defying his father’s wishes. Hanley wrote two volumes of autobiography, Broken Water (1937) and No Directions (1943). During the Second World War he worked for the BBC and for the Ministry of Information, and between 1938 and 1943 wrote three novels which Henry Green described as the best stories about the sea since Jospeh Conrad. Altogether he wrote thirty novels, sixteen volumes of short stories, six plays, and many radio and TV scripts. Thanks perhaps to his bleakness, he never won a huge audience. He died in London on 11 November 1985. My information (so far) comes from the Oxford Dictionary of National Biography (by Meic Stephens), from the Dictionary of Irish Biography (by Laurence William White) and from the anonymous Wikipedia article. I shall be working further on this entry.